Dez Bryant decided to leave Sunday's loss a little early. Dez Bryant had a typical Dez Bryant game Sunday against the Packers. He made some huge plays, including a stunning TD grab that gave the Cowboys a 12-point lead with just under eight minutes remaining. But those moments will probably be overshadowed by his decision to leave the game and head to the locker room with 1:21 left. That happened right after Tony Romo threw an interception that all but ended the game. But still, leaving when there is still time left on the clock is not cool. Now that’s a weird explanation that makes little sense. People on Twitter were not impressed. Wonder what Jerry Jones will say about this one? 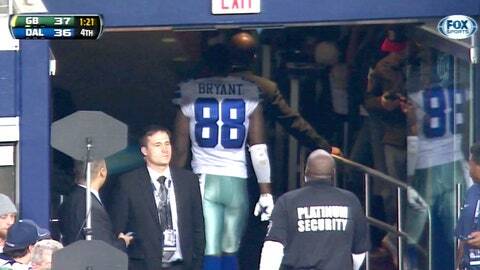 Dez Bryant leaving the field early lacked class unless he was hurt. Punk move by Dez Bryant to walk out on his #Cowboys teammates with time left on the clock. @DezBryant @NFLonFOX It makes you look like a sore loser. The rest of your team stayed out there and took it like men, why couldn't you? Two Tony Romo interceptions in the fourth quarter, Dez leaving with time left on the clock, and another epic collapse by the Cowboys. In other words – just your typical Sunday in Big D.